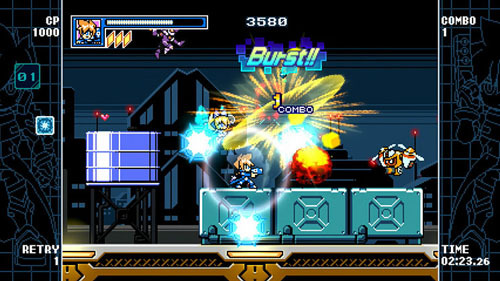 A game by Inti Creates for Switch, 3DS, and PS4, originally released in 2017, with the Gal*Gunvolt Burst version released in 2018. 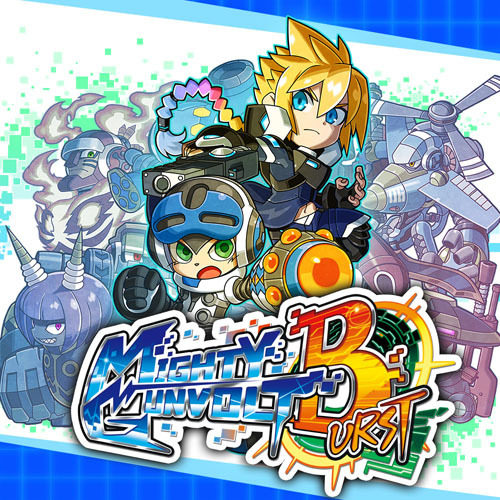 Inti Creates followed up their retro-style Mighty Gunvolt with Mighty Gunvolt Burst / Gal*Gunvolt Burst, which once again features Gunvolt from Azure Striker Gunvolt and Beck from Mighty No. 9. There are several additional downloadable characters as well, including Ekoro and Kurona from Gal*Gun (Ekoro also appears in the original Mighty Gunvolt as a standard character, and is a standard character in the Gal*Gunvolt Burst version), Call and RAY from Mighty No. 9, and Joule and Copen from the Azure Striker Gunvolt series. Each character has his or her own playstyle, movement abilities, and weapons, although the levels themselves remain unchanged aside from a few story elements. 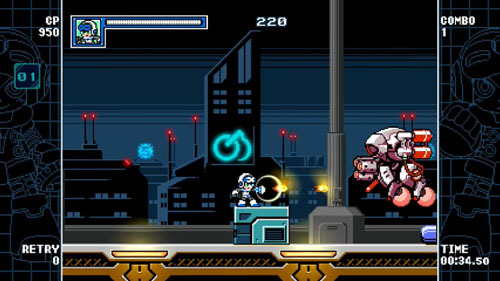 The game is not a canonical part of any of the aforementioned series, but rather takes place in a VR setting and acts as a retro throwback actioner heavily inspired by the Mega Man series. It’s a somewhat more substantial outing than its bite-sized predecessor, weighing in around two or three hours on a first attempt. Beck, Gunvolt, or whichever character you’ve downloaded have been sucked into a VR world and must defeat the eight robot masters… er, rather the eight robotic Mighty Numbers, in order to escape the simulation. Instead of simply gaining the abilities of defeated bosses, the player unlocks chips which may be applied to his weapon via an extraordinarily robust customization system. 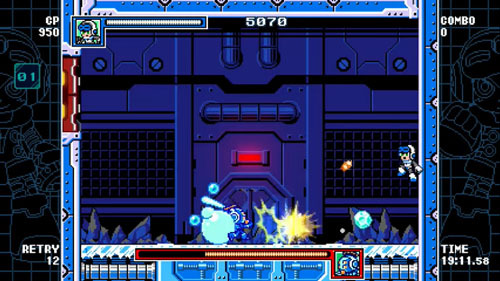 Players are able to create a vast array of weaponry using chips acquired from defeated bosses and discovered across multiple hidden areas in each level. 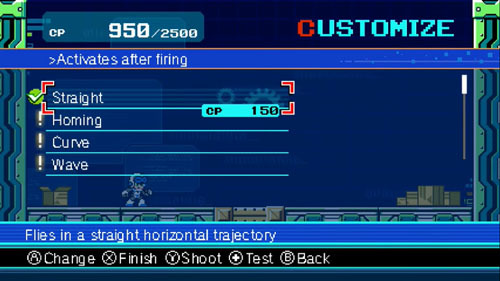 At first, the player’s ability to create weapons is limited to basic buster shots and the like, but soon the player is given the ability to customize nearly every aspect of his weapon, and save dozens of different weapon configurations for quick access during the game. Players may select their projectile type, firing rate, auto-fire options, the number of bullets onscreen at a time, whether bullets pass through enemies and/or solid objects, and how bullets move when fired, whether in a straight line, a curve, a wave pattern, a spread shot, or homing projectiles. Players even control what happens to projectiles after they’re fired, such as bouncing off the walls or exploding on contact… and even these features have individual stats that can be tweaked. There are also customizations that allow the player to sustain more damage, find hidden objects in the environment, or perform air dashes or double jumps. Although most upgrades are stackable, the player can’t just throw every single upgrade onto his character at once... As the player makes progress in the game, he discovers energy crystals that are used as a power source, and each upgrade uses a certain amount of energy. The player needs to decide which upgrades are most important, and then make sacrifices in other areas to balance the energy meter. There is a constant give and take as the player discovers new weapons and upgrades that may be more useful in combat. All of this customization means that players can engage the game however they like, although in practice, there are far more options than are warranted by the enemies and environments. 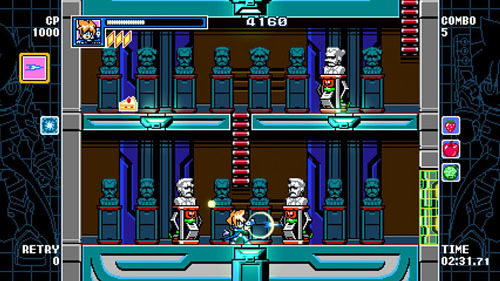 Players can spend half the game tweaking their weapon toward the most optimal loadout if they like (and this can be done mid-game as well), but levels can be completed with any configuration if the player is skilled at shooting and platforming, and the game features infinite lives with a generous continue system. Furthermore, the advanced customization options essentially give the player the ability to “break” the game by building up the energy meter and going overboard on specific upgrades. For instance, powering up your auto-fire, homing abilities, and explosive projectiles eventually allows you to walk through any level with the SHOOT button held down while enemies explode around you with no effort, and even bosses fall in a matter of seconds. One of the upgrades in the first level lets you sustain four times the normal amount of damage before being killed, making you virtually unstoppable even if your skills are rusty – insta-kill spikes notwithstanding – and even bosses can be defeated by brute force with your powered up health meter. When you do find yourself running low on health, you can pause and consume one of your food items, which are found throughout each level on the way to the boss. You can store multiple food items and use them whenever you like. 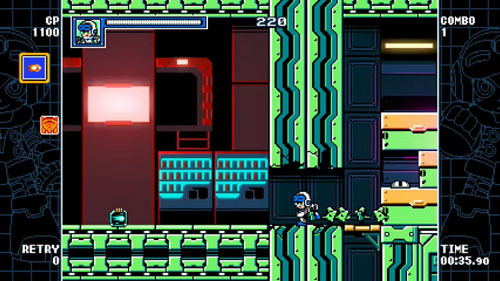 Once you’ve completed the opening tutorial level, the other levels may be played in any order, and once all eight of the Might Number robots have been defeated, the player can access a series of new levels that must be completed sequentially, per the conventions established in the Mega Man series. There is, of course, the requisite boss rush against each of the eight boss robots with no checkpoints between them. The word “burst” in the title refers to the burst combo system where the player builds up a combo by killing enemies in rapid succession, which leads to a higher score. The player’s score is shown at the end of each level and a button press reveals the corresponding letter grade. Players also earn pixel “stickers” by completing in-game challenges such as achieving a high burst combo ranking and beating all of the Mighty Numbers. 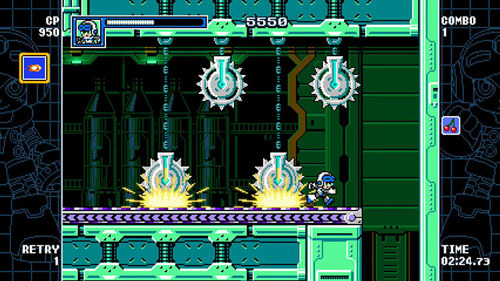 Weaponry aside, gameplay is all but identical to that found in the Mega Man series. 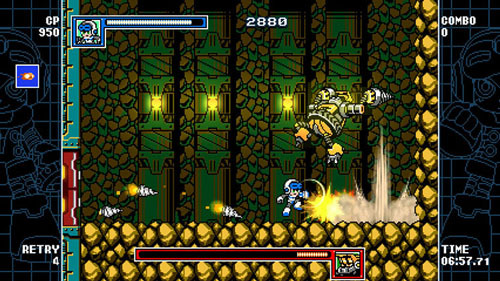 Players climb ladders, jump high underwater, pass through pause-and-scroll screen transitions, fight various robots, zip along conveyor belts, and avoid spikes at all costs. Players transition into empty rooms with doors on either side prior to each boss battle, which take place in single screen environments, and each boss is weak to a specific blaster type… although the heavy weapon customization element means that these weaknesses may be freely ignored. 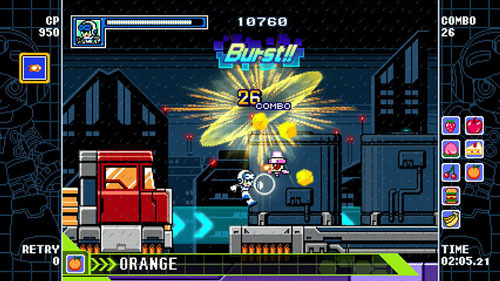 Mighty Gunvolt Burst was developed by Japanese studio Inti Creates. 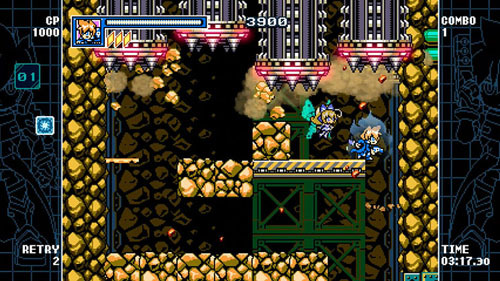 The studio also developed the Azure Striker Gunvolt series, the Gal*Gun series, Mighty Gunvolt, Blaster Master Zero, Bloodstained: Curse of the Moon, and most of the latter day entries in the Mega Man series, including the Mega Man Zero series, Mega Man 9, Mega Man 10, Mega Man ZX, and Mega Man ZX Advent.